Advisor to Governor, K Vijay Kumar on Saturday visited army camp which suffered damage in a fire incident earlier this week at Machil along the Line of Control in north Kashmir's Kupwara district.On Aug 28, at least eight barracks and three office buildings of army's 45 RR headquarter camp were gutted in a fire incident at Hammar Gali area of Machil sector along the line of control (LoC).During the visit he also met local delegations who demanded electrification of the area as well as installing mobile tower in Machil so as to have mobile connectivity.Sources told GNS that the advisor on the complaint by the locals directed health authorities to ensure doctors are posted in the area during winters and promised rupees 15000 as additional allowance for the doctors who discharge duties during the winters.Advisor was accompanied by Principal Secretary Health & Medical Education, Dr Pawan Kotwal, District Development Commissioner Kupwara, Khalid Jahangir, ADDC M Y Mir, ASP Kupwara Shafqat Ahmad and other concerned officials.At Machil, the Advisor visited Health Centre Duddi where he chaired a meeting of officials of health department of the district which was attended by CMO Kupwara, Dr Prahlad Singh, BMO and other functionaries. The Advisor was informed about the health scenario, facilities available in the context of difficult terrain and requested for augmentation of men and machinery for catering to the needs of the area.The Advisor urged the health officials to work with added zeal towards ensuring better healthcare and timely vaccination of all the villages of Machhil.To review the developmental scenario, K Vijay Kumar convened a meeting of officers of all key departments where he took sector wise review of implementation of all components of developmental projects in the area. He stressed upon the concerned to work with sincerity and dedication for the holistic development of Machhil.He directed the officers to visit Machhil regularly for redressal of people’s issues at least once in a month. Sheep Husbandry department was asked to ensure sustained contact with the people towards creating awareness about schemes for enhancing living standards through rearing of livestock, availability of vaccination and other necessary veterinary facilities for the people concerned.Kumar emphasized the need for improving agricultural and horticultural sectors through expert intervention by the concerned departments towards ensuring better dividends to people of the Machhil associated with these sectors. 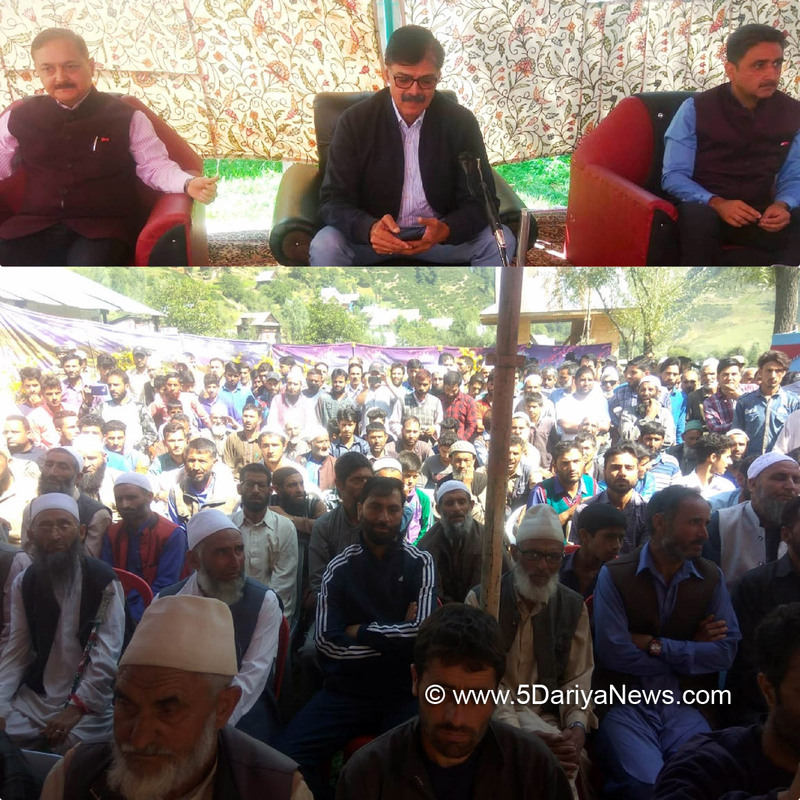 He also directed the Beacon authorities to accelerate the pace of work so that the blacktopping of the road from Kupwara to Machhil is completed by the end of November. He further directed the PDD to ensure completion of Receiving Station by the end of November.